Con­sis­tent UART port with low vol­ta­ge costs just 1.75 $. 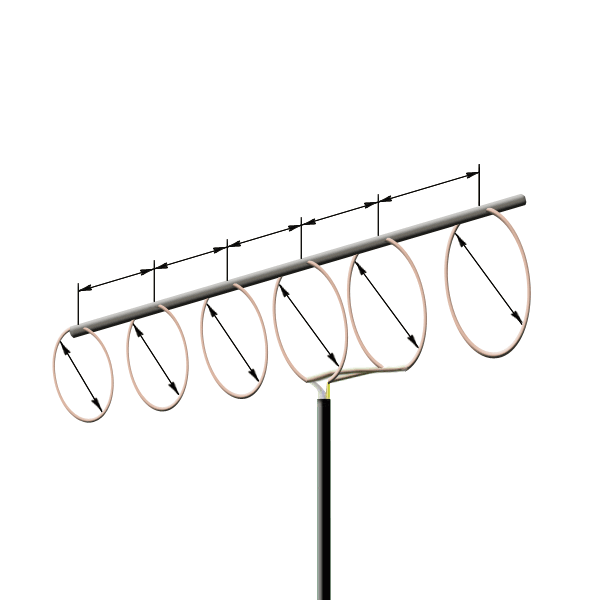 This antenna consists of 6 metal rings fastened to one dielectric guide. The power gain is up to 18 Db, so it can be used for far reception of DVB-T2 signals. The author of the construction N. Turkin published the construction and the calculation of the antenna in the magazin Radio №11 in 2000 and then a famous amateur radio operator V. Polyakov changed the size of the elements and the distance between them in such way that the power gain grew. The calculation there was made basing on the Polyakov&apos;s formulae. For making such an antenna copper wire or a tube with the diameter 2-5 mm are usually used. Pay attention to the constraction of the driven element which is a folded dipole: two rings are connected below with each other criss- cross and these connections should not touch each other.